This recipe was originally posted in December of 2011. From time to time, I am going to go back and redo some of the recipes that I made back when I didn't really know what I was doing. I still am not the best photographer, but I can at least make it look like something you might want to put in your mouth. Originally, I thickened this recipe with cornstarch, but I remade it using butter, and the results were a lot better. So while this has more fat than the original posted recipe, I think it is worth it. This dish is so light and flavorful and is definitely one of my favorites. It is satisfying enough to keep you full for a while, but does not weigh you down. I like to serve it with rice and spinach and spoon some of the lemon juice over both of them. 1. Combine chicken broth, lemon juice and capers; set aside. 2. Melt olive oil and butter in a large skillet; while that is heating, sprinkle tilapia with salt and pepper. In a small dish, sprinkle flour and dredge tilapia through, shaking off excess. 3. When olive oil and butter is very hot, place tilapia in the skillet and cook about 3 minutes on each side, or until the fish flakes easily with a fork. 4. Remove tilapia and add broth mixture to the pan, scraping up the browned bits. Bring mixture to a boil and cook until reduced down to about 1/2 cup, about 3-4 minutes. Whisk in remaining two teaspoons of butter and cook until thickened slightly. Remove from heat. 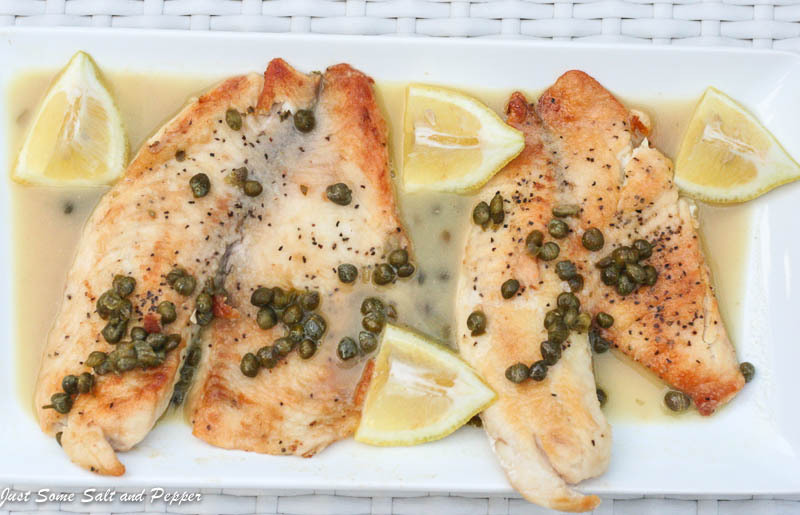 To serve, drizzle lemon sauce over tilapia. I go back and retake photos all the time :) This recipe looks great, my two boys are obsessed with any type of fish right now. If they had their way we would eat seafood three times a day! I'd like to re-do some of my old recipes too... especially ones I really liked but the pictures probably didn't do it justice. Never seem to get around to it though! : ) I love the idea of using fish instead of the typical chicken in this dish. It really looks delicious. Light and delicious. My kind of recipe. This is such a tasty way to prepare tilapia! I love a good buttery, lemony fish. Lovely recipe! 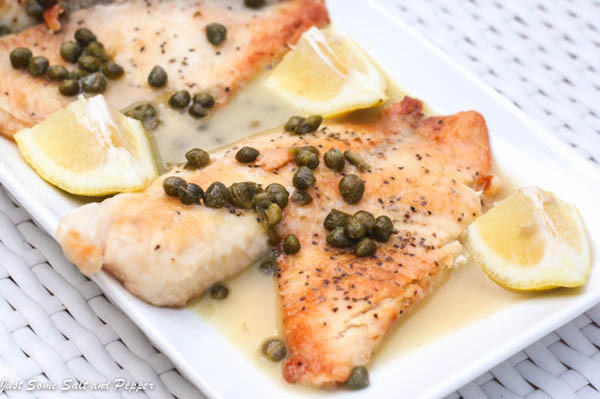 This recipe looks great- I love chicken piccata so I know I would love this tilapia version too! This looks wonderful... I make a similar dish but for some reason I don't like capers.... I wish I did - they look great on this dish!